When mortised, this push knob assures safety and a sleek looking appearance. Suitable for left or right side use (non-handed), and inset as well as overlay mounting. 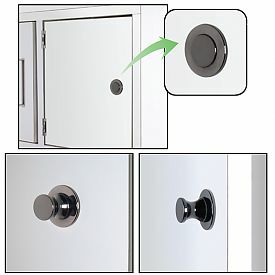 After the door is closed, pushing in the knob activates and secures the latch to the door will not open until the knob is pushed again. Note: This product is also known as PKL-08/GA on other websites. 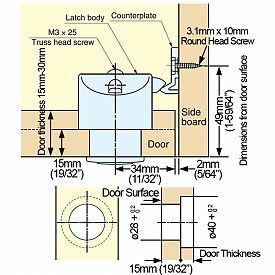 Door Thickness: For doors 19/32in. (15mm) to 1-3/16in. (30mm) thick. NOTE: For doors 33/64in. (13mm) thick, use a plastic spacer 15/32in. (2mm) thick).